A team of European astronomers ,  has discovered a Brown Dwarf object (a 'failed' star) less than 12 light-years from the Sun. It is the nearest yet known. Now designated Epsilon Indi B, it is a companion to a well-known bright star in the southern sky, Epsilon Indi (now "Epsilon Indi A"), previously thought to be single. The binary system is one of the twenty nearest stellar systems to the Sun. The brown dwarf was discovered from the comparatively rapid motion across the sky which it shares with its brighter companion : the pair move a full lunar diameter in less than 400 years. It was first identified using digitised archival photographic plates from the SuperCOSMOS Sky Surveys (SSS) and confirmed using data from the Two Micron All Sky Survey (2MASS). Follow-up observations with the near-infrared sensitive SOFI instrument on the ESO 3.5-m New Technology Telescope (NTT) at the La Silla Observatory confirmed its nature and has allowed measurements of its physical properties. Epsilon Indi B has a mass just 45 times that of Jupiter, the largest planet in the Solar System, and a surface temperature of only 1000 °C. It belongs to the so-called 'T dwarf' category of objects which straddle the domain between stars and giant planets. 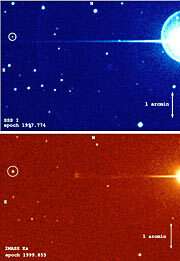 Epsilon Indi B is the nearest and brightest T dwarf known. Future studies of the new object promise to provide astronomers with important new clues as to the formation and evolution of these exotic celestial bodies, at the same time yielding interesting insights into the border zone between planets and stars. Imagine you are a professional ornithologist, recently returned home from an expedition to the jungles of South America, where you spent long weeks using your high-powered telephoto lenses searching for rare species of birds. Relaxing, you take a couple of wide-angle snapshots of the blooming flowers in your back garden, undistracted by the common blackbird flying across your viewfinder. Only later, when carefully comparing those snaps, you notice something tiny and unusually coloured, flittering close behind the blackbird: you've discovered an exotic, rare bird, right there at home. In much the same way, a team of astronomers  has just found one of the closest neighbours to the Sun, an exotic 'failed star' known as a 'brown dwarf', moving rapidly across the sky in the southern constellation Indus (The Indian). Interestingly, at a time when telescopes are growing larger and are equipped with ever more sophisticated electronic detectors, there is still much to be learned by combining old photographic plates with this modern technology. Photographic plates taken by wide-field ("Schmidt") telescopes over the past decades have been given a new lease on life through being digitised by automated measuring machines, allowing computers to trawl effectively through huge and invaluable data archives that are by far not yet fully exploited . For the Southern Sky, the Institute for Astronomy in Edinburgh (Scotland, UK) has recently released scans made by the SuperCOSMOS machine of plates spanning several decades in three optical passbands. These data are perfectly suited to the search for objects with large proper motions and extreme colours, such as brown dwarfs in the Solar vicinity. In astronomy, the `proper motion' of a star signifies its apparent motion on the celestial sphere; it is usually expressed in arcseconds per year . The corresponding, real velocity of a star (in kilometres per second) can only be estimated if the distance is known. A star with a large proper motion may indicate a real large velocity or simply that the star is close to us. By analogy, an airplane just after takeoff has a much lower true speed than when it's cruising at high altitude, but to an observer watching near an airport, the departing airplane seems to be moving much more quickly across the sky. Proxima Centauri, our nearest stellar neighbour, is just 4.2 light-years away and has a proper motion of 3.8 arcsec/year (corresponding to 23 km/sec relative to the Sun, in the direction perpendicular to the line-of-sight). The highest known proper motion star is Barnard's Star at 6 light-years distance and moving 10 arcsec/year (87 km/sec relative to the Sun). All known stars within 30 light-years are high-proper-motion objects and move at least 0.2 arcsec/year. For some time, astronomers at the Astrophysical Institute in Potsdam have been making a systematic computerised search for high-proper-motion objects which appear on red photographic sky plates, but not on the equivalent blue plates. Their goal is to identify hitherto unknown cool objects in the Solar neighbourhood. They had previously found a handful of new objects within 30 light-years in this way, but nothing as red or moving remotely as fast as the one they have now snared in the constellation of Indus in the southern sky. This object was only seen on the very longest-wavelength plates in the SuperCOSMOS Sky Survey database. It was moving so quickly that on plates taken just two years apart in the 1990s, it had moved almost 10 arcseconds on the sky, giving a proper motion of 4.7 arcsec/year. It was also very faint at optical wavelengths, the reason why it had never been spotted before. However, when confirmed in data from the digital Two Micron All Sky Survey (2MASS), it was seen to be much brighter in the infrared, with the typical colour signature of a cool brown dwarf. At this point, the object was thought to be an isolated traveller. However, a search through available online catalogues quickly revealed that just 7 arcminutes away was a well-known star, Epsilon Indi. The two share exactly the same very large proper motion, and thus it was immediately clear the two must be related, forming a wide binary system separated by more than 1500 times the distance between the Sun and the Earth. Epsilon Indi is one of the 20 nearest stars to the Sun at just 11.8 light years . It is a dwarf star (of spectral type K5) and with a surface temperature of about 4000 °C, somewhat cooler than the Sun. As such, it often appears in science fiction as the home of a habitable planetary system . That all remains firmly in the realm of speculation, but nevertheless, we now know that it most certainly has a very interesting companion. This is a remarkable discovery: Epsilon Indi B is the nearest star-like source to the Sun found in 15 years, the highest proper motion source found in over 70 years, and with a total luminosity just 0.002% that of the Sun, one of the intrinsically faintest sources ever seen outside the Solar System! After Proxima and Alpha Centauri, the Epsilon Indi system is also just the second known wide binary system within 15 light years. However, unlike Proxima Centauri, Epsilon Indi B is no ordinary star. Within days of its discovery in the database, the astronomers managed to secure an infrared spectrum of Epsilon Indi B using the SOFI instrument on the ESO 3.5-m New Technology Telescope (NTT) at the La Silla Observatory (Chile). 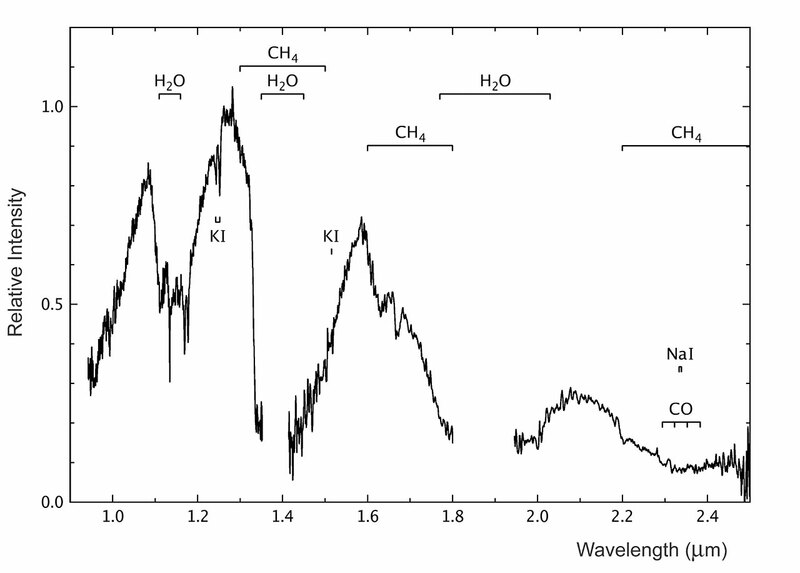 The spectrum showed the broad absorption features due to methane and water steam in its upper atmosphere, indicating a temperature of 'only' 1000 °C. Ordinary stars are never this cool - Epsilon Indi B was confirmed as a brown dwarf. Brown dwarfs are thought to form in much the same way as stars, by the gravitational collapse of clumps of cold gas and dust in dense molecular clouds. However, for reasons not yet entirely clear, some clumps end up with masses less than about 7.5% of that of our Sun, or 75 times the mass of planet Jupiter. Below that boundary, there is not enough pressure in the core to initiate nuclear hydrogen fusion, the long-lasting and stable source of power for ordinary stars like the Sun. Except for a brief early phase where some deuterium is burned, these low-mass objects simply continue to cool and fade slowly away while releasing the heat left-over from their birth. Theoretical discussions of such objects began some 40 years ago. They were first named 'black dwarfs' and later 'brown dwarfs', in recognition of their predicted very cool temperatures. However, they were also predicted to be very faint and very red, and it was only in 1995 that such objects began to be detected. The first were seen as faint companions to nearby stars, and then later, some were found floating freely in the Solar neighbourhood. Most brown dwarfs belong to the recently classified spectral types L and T, below the long-known cool dwarfs of type M. These are very red to human eyes, but L and T dwarfs are cooler still, so much so that they are almost invisible at optical wavelengths, with most of their emission coming out in the infrared. .
How massive is Epsilon Indi B? The age of most brown dwarfs detected to date is unknown and thus it is hard to estimate their masses. However, it may be assumed that the age of Epsilon Indi B is the same as that of Epsilon Indi A, whose age is estimated to be 1.3 billion years based on its rotational speed. Combining this information with the measured temperature, brightness, and distance, it is then possible to determine the mass of Epsilon Indi B using theoretical models of brown dwarfs. Two independent sets of models yield the same result: Epsilon Indi B must have a mass somewhere between 4-6% of that of the Sun, or 40-60 Jupiter masses. The most likely value is around 45 Jupiter masses, i.e. well below the hydrogen fusion limit, and definitively confirming this new discovery as a bona-fide brown dwarf. ESO Press Photo eso0303 shows the current census of the stars in the solar neighbourhood. 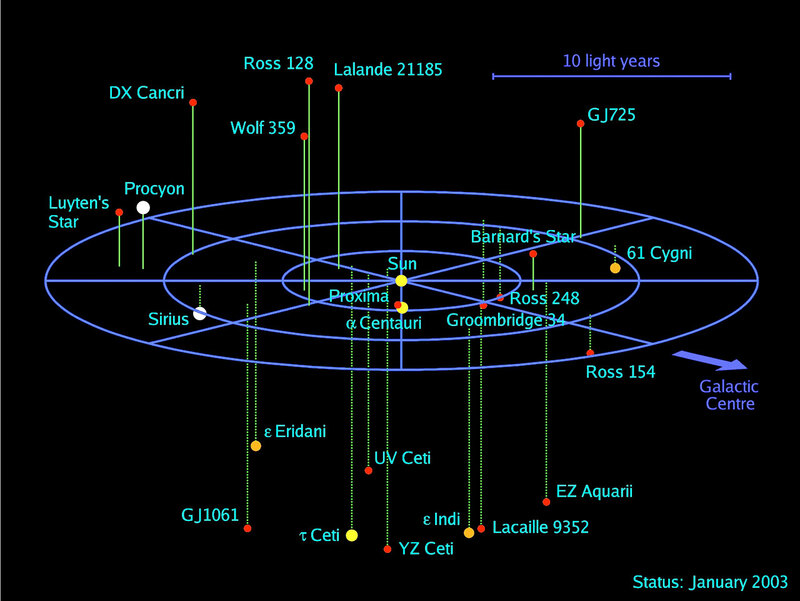 All these stars have been known for many years, including GJ1061, which, however, only had its distance firmly established in 1997. The discovery of Epsilon Indi B, however, is an extreme case, never before catalogued, and the first brown dwarf to be found within the 12.5 light year horizon. If current predictions are correct, there should be twice as many brown dwarfs as main sequence stars. Consequently, Epsilon Indi B may be the first of perhaps 100 brown dwarfs within this distance, still waiting to be discovered! Epsilon Indi B is an important catch well beyond the cataloguing the Solar neighbourhood. As the nearest and brightest known brown dwarf and with a very accurately measured distance, it can be subjected to a wide variety of detailed observational studies. It may thus serve as a template for more distant members of its class. With the help of Epsilon Indi B, astronomers should now be able to see further into the mysteries surrounding the formation and evolution of the exotic objects known as brown dwarfs, halfway between stars and giant planets, the physics of their inner cores, and the weather and chemistry of their atmospheres. 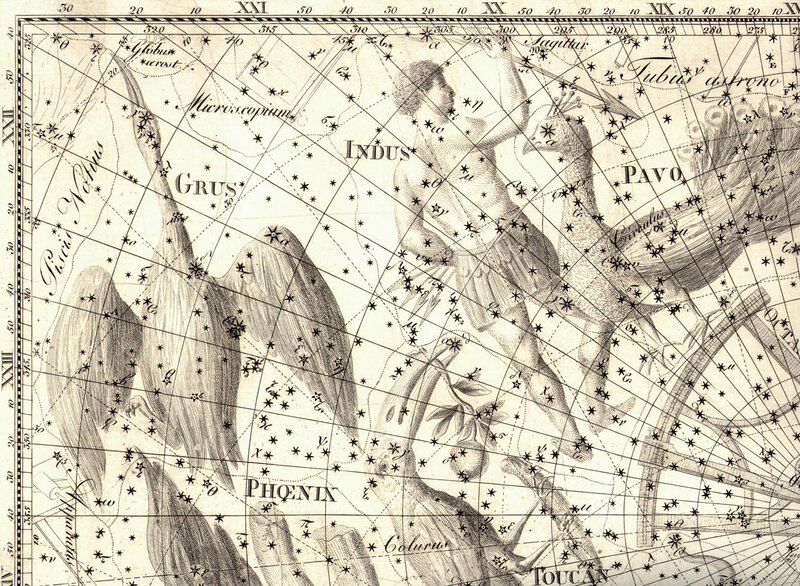 The constellation Indus lies deep in the southern sky, nestled between three birds, Grus (The Crane), Tucana (The Toucan) and Pavo (The Peacock), cf. ESO Press Photo eso0303. First catalogued in 1595-1597 by the Dutch navigators Pieter Dirkszoon Keyser and Frederick de Houtman, this constellation was added to the southern sky by Johann Bayer in his book 'Uranometria' (1603) to honour the Native Americans that European explorers had encountered on their travels. In particular, it has been suggested that it is specifically the native peoples of Tierra del Fuego and Patagonia that are represented in Indus, just over two thousand kilometres south of La Silla where the first spectroscopic observations of Epsilon Indi B were made some 400 years later. In the later drawing by Bode shown here, Epsilon Indi, the fifth brightest star in Indus, is associated with one of the arrows in the Indian's hand. This is a joint press release of the European Southern Observatory (ESO) and the Astrophysical Institute Potsdam (Germany). A German version of this press release is also available. The team consists of Ralf-Dieter Scholz, Mark McCaughrean, Nicolas Lodieu (Astrophysical Institute Potsdam, Germany) and Bjoern Kuhlbrodt (Hamburg Observatory, Germany). The SuperCOSMOS Sky Surveys (SSS) at the Wide-Field Astronomy Unit of the Institute for Astronomy at the University of Edinburgh include digitised data of UKST Schmidt plates in the BJ-, R- and I-passbands, with additional scans of ESO and POSS1 Schmidt plates in the R-band. A dedicated compilation of all photographic plates obtained for astronomical studies during the past century is carried out by the Wide-Field Plate Database project, based at the Institute of Astronomy of the Bulgarian Academy of Sciences in Sofia. 1 arcsec (arcsecond) is 1/60th of 1 arcmin (arcminute), which in turn is 1/60th of 1° (degree). A proper motion of 1 arcsec/year corresponds to a position change of 1° (two full lunar diameters) in 3600 years. Distances for relatively nearby objects can be measured accurately via the technique of "trigonometric parallax". As the Earth orbits the Sun, nearby objects appear to move slightly against the relatively fixed background of distant, faint stars. By measuring the shift of the nearby star over a six month period, its distance from the Earth can be calculated via standard trigonometry, knowing the distance of the Earth from the Sun. The ESA Hipparcos satellite, orbiting the Earth in the 1990s, measured a distance to Epsilon Indi of 3.626 parsecs or 11.82 light years (112 million million kilometres), with an error of just 0.3%. Epsilon Indi has been suggested to have a planetary system in many works of science fiction, including the "Known Space" novels of Larry Niven, the award-winning short story "Sleeping Dogs" by Harlan Ellison, episodes of both the original Star Trek and the more recent Next Generation series, and in many role-playing and fan fiction sites on the Internet. Definitions of the new L and T spectral classes, along with detailed information on their photometric and spectroscopic characteristics can be found at these websites:http://spider.ipac.caltech.edu/staff/davy/ARCHIVE/ and http://www.astro.ucla.edu/~adam/homepage/research/tdwarf/. Other ESO Press Releases about brown dwarf objects include eso9709, eso0023, eso0124, and eso0220. The information in this press release is based on a paper ("Epsilon Indi B: a new benchmark T dwarf" by Ralf-Dieter Scholz and co-authors), soon to be published in the European journal Astronomy & Astrophysics (Letters). It is available on the web in preprint form at http://arxiv.org/abs/astro-ph/0212487.